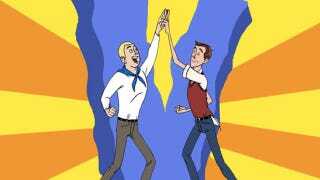 Venture Brothers renewed for two more seasons, with an animated short coming this summer! We live in an era in which genre TV shows are perpetually dancing on the razor's edge, so it's nice to know that one of our favorites is going to be around for a while. Venture Bros. Season 5 is a go (and the annual Venture Xmas song)! We've recently signed a new contract with adultswim to produce two more seasons of The Venture Bros.
Doc and I officially started writing last week. Though, in truth, we technically started writing season 5 last year when we accidentally brainstormed a handful of (we think) pretty hot new stories while we were writing the season 4 finale. Our goal is to have enough scripts to comfortably begin pre-production by June [...] Our contract also includes a long-form (60-90 min.) Venture Bros. special. Don't ask me when we'll make it, what it's going to be about, or whether it'll be on TV or direct-to-DVD, because we don't have a clue yet. We've been secretly working on an 11 minute Venture Bros. special for the past couple of months. A sort of light-hearted, one-off little aperitif we're producing and animating entirely in-house at Titmouse Studios in NY and LA. It will premiere some time this summer. Good times! Frankly, I want to see a whole lot more Brick Frog next season. This week&apos;s Venture Bros. gave us the lousiest supervillain auditions ever!